For the couple of nights prior to your hedgehogs arrival, sleep in the same tshirt and then put that in the cage the day of pick up. This will help your new friend get acclimated to your scent. Handling. While we handle the hedgehogs multiple times a day here, expect your new friend to most likely be huffy at first. The sights, sounds, and scents of your house are all new and different to him and he most likely will spend the bulk of the time being shy in his hide. We know you are going to naturally want to handle your hedgehog- we get that, we did too! But for the first couple of days, just keep it to a minimal so he has time to adjust. After that though, please handle your hedgehog- even when he turns into a ball of spikes. Hedgehogs are clever, you don't want to teach him that if he puffs up, you'll put him back in his cage- he'll catch on to that trick fast. Try not to use gloves- you want him to get used to your scent. While the quills can be super prickly, we've never once been punctured by any of ours- it just stings for a bit at first, but you get used to it pretty quickly. Be consistent and calm and he'll come around. You don't have to be chained to whatever room that the cage is in... watch your favorite TV shows with your new friend, scroll through facebook on your phone or laptop, do your homework with him hanging out on your lap in a snuggle sack- just please be sure to spend one on one time daily with your hedgehog (not just when you are giving it fresh food and water)- even if it's only for a few minutes if you are busy. Quilling. Hedgehogs will quill several times in their life... it's akin to humans getting their teeth. Quills will fall out and new bigger quills will take their place. Just like with people, this time can be uncomfortable for a hedgehog and make it irritable and sensitive to being touched. Unfortunately the first quilling happens around the same time your hedgehog is going home to you- it generally starts in the 6-8 week old stage. Not great timing as you are trying to get to know your new pet! Just be patient and gentle. You'll notice lots of quills laying around the cage and that's completely normal. Heads up, if they end up on the floor they are worse then legos to step on, lol. Nipping. While in our experience adult hedgehogs rarely bite, I have to say, some baby hedgehogs can be very much like toddlers who want to put everything in their mouth as a way to examine the world, lol. New smells will especially be a trigger, so it's a good idea to always wash your hands before handling your hedgehog so that your hand doesn't smell like a tasty treat. If you are ever bitten by your hedgehog, then a quick blow to the face is an effective deterrent. If possible, don't put your hedgehog back into its cage directly after a nip, that will teach her that a good way to get back to her hide is a bite. Chances are, you'll never be bitten by your hedgie, but I just wanted to put out there that it is a possibility so that you are aware. Food. We will always let you know the current blend of food that they are on when they leave here and send you home with a baggie of it. It is always a mixture of at least three types of high end dry cat food. We mix them for a couple of reasons. 1) It helps balance out the nutrients. 2) If one brand isn't available when we need it or if the hedgies seem to pick around a specific kind, it can be easily switched out without upsetting their tummies since it is only a 1/3 of their diet. 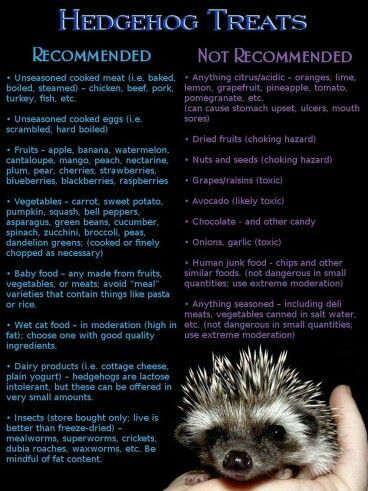 Never feed your hedgehog food from the pet store that is labeled hedgehog food. Maybe someday they will improve it, but right now none of the available kinds are sufficient for a hedgehogs health. When shopping for a cat food, look on the label to make sure that one of the first few ingredients is real meat (chicken, turkey, duck), that the protein is between 28-34%, and the fat is between 10-15%. You do not want to see in the first five ingredients by-products, corn, gluten, soy, wheat, beets, or powdered cellulose. Avoid potatoes, lentils, and peas in those first five ingredients as well when possible (that's harder though). Until they are 4 months old, you can let your hedgehogs free feed- which just means fill their bowl up and let them decide how much they want to eat. Some hedgehogs can be free fed their whole lives, but some are gluttons, lol, and will get overweight if left to their own devices. If your hedgie is getting too big, then only feed them around a tablespoon a night. Since all hedgehogs differ in size and what is normal for them, a good way to tell if your hedgehog is overweight is if he can't ball up all the way. Annointing. So your hedgehog is going to do this really weird thing sometimes. When they smell something new, hedgehogs have a strange habit of what's called "annointing", which consists of them craning their neck back in a ridiculously uncomfortable looking position and spreading a foaming saliva all over their quills. It's more bizarre then gross, but it is a little gross, lol. No one is quite sure why they do it, but it's completely normal, so don't fret when you see this display. Wheel cleaning. Most hedgehogs will run for hours every night on their wheels. It's good for them and helps to keep them from being bored and restless- so yay for wheel running! But then you realize that hedgehogs running for hours means hedgehogs running in poo for hours, lol. You can wipe your wheel down daily to help cut down on the build up (baby wipes are great for this), but you will still need to do a thorough cleaning of the wheel at least once a week. We soak ours in a bathtub here (upside down where the ball bearings are all facing up) , but you can find your own method to keep the wheel clean. Feet cleaning. So, with all of that running in poo, their wheel isn't the only thing that gets dirty, lol. Your beautiful baby WILL have poop boots. But it's an easy fix! A half an inch or so of warm water in your bathroom sink (or a bucket if doing it in the sink grosses you out) and a soft toothbrush on standby if needed and voila! Easy peasy, it usually only takes a couple of minutes. Just be sure to dry your hedgehog off thoroughly afterwards so she doesn't get the chills. Baths. Your hedgehog will need baths occasionally. Not very often because it could cause dry and itchy skin for them, but as needed. Just fill the sink or tub with a 1 1/2-2 inches of warm water (not above their face of course). Try very hard to not get water in their ears, it could cause ear infections. Mix some Aveeno Baby Soothing Relief Creamy Wash into the water and then place your hedgie in. Using a soft toothbrush, place about a pea sized amount of the Aveeno on it and then clean your hedgehogs quills with it. WARNING- you might need to drain and refill the water several times during their bath... the warm water usually causes your hedgehog to poo. Using a cup or a small kids bucket, rinse your hedgehog off a few times with fresh, warm water. When you are finished with the bath, dry off your hedgehog very well so that she doesn't get too cold.